Shingletree Pond is located in the 40,036 acre Hammond Pond Wild Forest. The trail to Shingletree Pond is known more as an access trail under I-87 that takes hikers into a remote trail less section of Dix Mountain Wilderness. It is popular for bushwhackers looking for a true wilderness adventure in the Adirondacks. The 0.8 mile hike to Shingletree Pond is a great little leg stretcher for those looking for a quick hike to a scenic little pond. 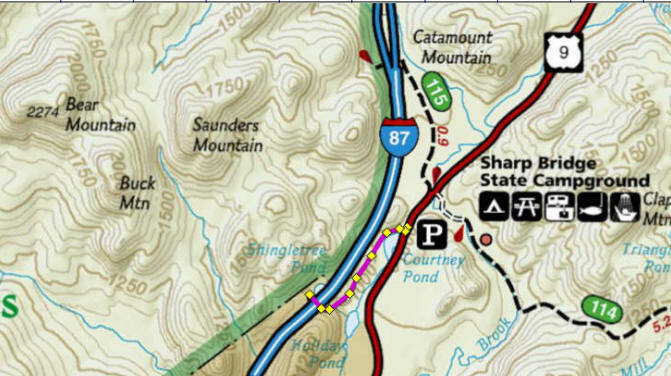 The trailhead is located along US 9 about 0.2 miles south of Sharp Bridge State Campground. There is a small parking area located at Courtney Pond (pano above). The GPS coordinates are N44 02.396 W73 40.892 of the parking area. There is a DEC Trail Sign located along US 9. The trail passes by the end of Courtney Pond before turning left and heading south. The trail joins an old road at 0.7 miles, then climbs to reach a rather long culvert under I-87. The trail ends after the culvert upon reaching Shingletree Pond at 0.8 miles. The DEC sign says it is 1.1 miles to Shingletree Pond. I GPS'd the hike at 0.8 miles. The trail ends at Shingletree Pond and beyond is a remote trail less area of the Dix Mountain Wilderness. Be sure that you are properly equipped if you decide to explore the remote wilderness past the pond. This includes a compass, map, backpacking supplies. For more info on this hike and the DIx Mountain Wilderness we recommend the hiking guide plus map High Peaks Trails Map Pack or just the maps Trails of the Adirondack High Peaks Map and/or Lake Placid, High Peaks: Adirondack Park (National Geographic Trails Illustrated Map) .